This movie camera was used by Australian photographer and cinematographer Frank Hurley (1885–1962) for 30 years. It accompanied him from Antarctica to the Middle East. It was also used to record important events at home, such as the building of Sydney Harbour Bridge. Hurley bought this camera, a new Parvo model L, before he left for his third Antarctic trip in 1929. 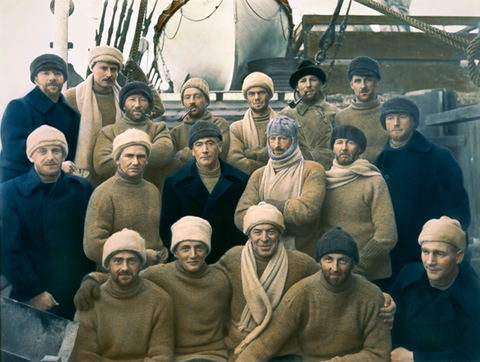 He was Official Photographer and Cinematographer to the British, Australian and New Zealand Antarctic Research Expeditions. I unpacked three cases containing my cinematograph gear which has been shipped under bond from France. The instrument which is by Debrie is a glorious piece of mechanism and the ideal of perfection for my work. Hurley used the Debrie for the next three decades. In Antarctica from 1929 to 1931 he recorded life aboard Discovery, the intriguing wildlife and majestic pack ice, and the scientific work of the expeditions. He failed, however, to capture perhaps the most important moment of the voyages, Sir Douglas Mawson's proclamation of British sovereignty over parts of Antarctica. The proclamation was made during a rushed trip and Hurley apparently did not have time to set up his unwieldy camera and tripod, which weighed about 80 pounds, or 36 kilograms. He still managed to include the event in Siege of the South, his documentary film of the expeditions. He simply filmed Mawson re-enacting the proclamation on the cliffs at Bondi, back in Sydney. Hurley's Debrie was originally a silent camera. Ten years later 'talkies' had replaced silent film and the Debrie was modified to render it capable of synchronisation with a sound recorder. Through the 1930s Hurley worked for Cinesound Productions, using the camera for films on the building of Sydney Harbour Bridge, life in the backblocks of South Australia and the attractions of the Blue Mountains and Tasmania. He may also have used the Debrie for location shoots when working on features such as Charles Chauvel's Forty Thousand Horsemen. In August 1940 Hurley was appointed head of the Department of Information's Photographic Unit. When he flew out of Sydney for the Middle East he took his trusty Debrie. Filming in the desert was as difficult as in Antarctica, with sand and dust, rather than cold and ice, clogging the camera mechanism and obscuring lenses. Hurley and his team followed Australian forces in North Africa, recording at close range the battles of Bardia, Tobruk and El Alamein. From 1943 Hurley travelled throughout the Middle East making propaganda films for the British Ministry of Information. After the war Hurley turned increasingly to still photography. Shortly before his death in 1962 he agreed to sell the Debrie to Mr Railton, who ran a film production studio near Sydney. Hurley only sold the camera after he inspected the studio, to ensure it was a suitable home for the instrument. The camera saw many more years service and was used for various activities, including the production of animated television commercials. In 1984 antique camera enthusiasts Robert and Irene Goard acquired the Debrie. It was part of a large collection of cameras which came to the National Museum when the Goards retired in 2005. The Debrie arrived with numerous lenses and other accessories, some of them custom-made. There was also a set of film canisters inscribed in the photographer's instinctive style, with 'HURLEY'. Unfortunately, they were empty. Debrie Parvo model 'L' 35mm hand-crank movie camera and accessories, used by Frank HurleyA Debrie Parvo model 'L' 35mm hand-crank movie camera and accessories, consisting of: a camera shutter, five lenses (one with a bellows attachment), a view finder, an extension tube and a camera case.